From olden times, mistletoe represents one of the most mysterious, magical and at the same time, sacred plants of the European folklore. It is a symbol of fertility, protector of life, and an aphrodisiac. Being a parasitical plant, mistletoe grows as a hanging bush on the branches of trees. With its cylindrical stem, ramified in pairs and slightly thickened at the nodes, mistletoe can reach in time (it grows slowly) up to 60 cm in height. It has oval leafs, rounded at their tip and of a yellowish-green color. These maintain their fresh color all through the winter time. Also, in December, mistletoe fruits mature, having a rounded shape and white color. The flowers appear late in the autumn, and soon following, the fruits appear. The lifespan of this plant is approximately 70 years. Mistletoe can be found between tree branches (even those taller than 4-5 meters): poplar, willow, birch, pear and apple trees, hawthorn, plum, cherry, acacia, maple, chestnut, lime, or more rarely in ash or alder trees. The most "valuable" kind of mistletoe is that which grows in fruit bearing (especially apple) trees. Also, the ones which grow on pear trees, fir, birch, rose and ash trees are considered to be of superior quality. In order to unravel the origin of this plant's name, we have to know that in old times there was a belief according to which mistletoe was multiplied through bird excrements. The reasoning behind this belief was simple: mistletoe grew only on the branches of the trees on which the birds stood. Anglo-Saxons have thus named the plant "mistletoe" (where "mistel" means excrements and "toe" is a word for the expression "tree branch"). Prior to belonging to the series of symbols of the winter holidays, mistletoe was in old times considered to be a pagan religious symbol. It had magic attributes because it healed diseases, brought good fortune, protected against witchcraft, and was even considered to be a bringer of fertility. In the Middle Ages for example there was a belief according to which hanging mistletoe branches on the ceiling would protect the dwelling as well as its inhabitants against unclean spirits. Another example of mistletoe's magic properties concerns the Vikings, who considered this plant to have the power of bringing the dead back to life. The Romans used to legalize marriages with a famous kiss under mistletoe. Mistletoe is antispasmodic, calming, immuno-stimulator and immuno-modulator, medium cytostatic, purgative, an excellent cardiotonic, strong hypotensive, vermifuge and diuretic medicine. Because of its properties, it is recommended for treating cough (especially convulsive cough), bronchic asthma, and asthmatic attacks because of psychological tension. At the same time it can be calming in cases of epilepsy, nervous fits, hysteria, neurosis, dizziness, arterial hypertension, cardiac ischemia, memory disturbances associated with hypertension, hiccups, digestive and uterine cramps, predispositions to virosis, immunity disturbances in old age, ganglionary diseases. Externally it is efficient in leucorrhoea, gout and sciatica. Before starting a treatment based on mistletoe, one should obligatorily seek medical advice. 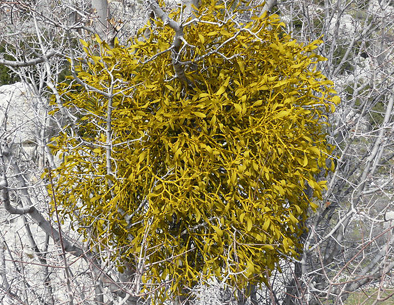 Generally, in obtaining mixtures based on mistletoe, the plant is used dry. It should be dried in an airy and shady room. Starting from the fact that the plant has cytostatic properties, the extract based on mistletoe was tried as a remedy for a number of types of cancer. The tests have shown important results in the cases of these medical measures: for starters, the negative effects of chemotherapy have been reduced, and the immune system stimulated. Mistletoe also is one of the ingredients of some treatments used for other diseases such as arthritis, rheumatism, hypertension or epilepsy. In case of convulsive cough and spasmodica, one teaspoon of mistletoe extract diluted in 100 ml of water should be consumed every day on an empty stomach. The mixture should be taken three times per day. For bronchic asthma, asthmatic fits because of psychological tension, hysteria, neurosis, dizziness, as an adjuvant in epilepsy and nervous fits, for arterial hypertension, cardiac ischemia, memory disorders associated with hypertension, arteriosclerosis, vascular, ganglion diseases, only half a teaspoon is used, diluted in 100 ml of water, 4 times per day on an empty stomach. For external use (leucorrhoea) lavements will be made with tincture diluted in water: one part tincture for five parts water. In cases of gout and sciatica, tincture compresses are used on the affected areas for one hour every day. Readers should not use this information for self-diagnosis or self-treatment, but should always consult a medical professional regarding any medical problems and before undertaking any major dietary changes. This information is not meant to be substituted for medical advice. Wash 10g of herb roots on running water; boil for over 2 hours depending on symptom in 2L of water.